Stuck on what to do to make New Year’s eve fun for your kids? We have the answers. New Year’s Eve features the traditional toast at midnight, which kids can’t partake in…or can they? With our secret recipe, they just might. 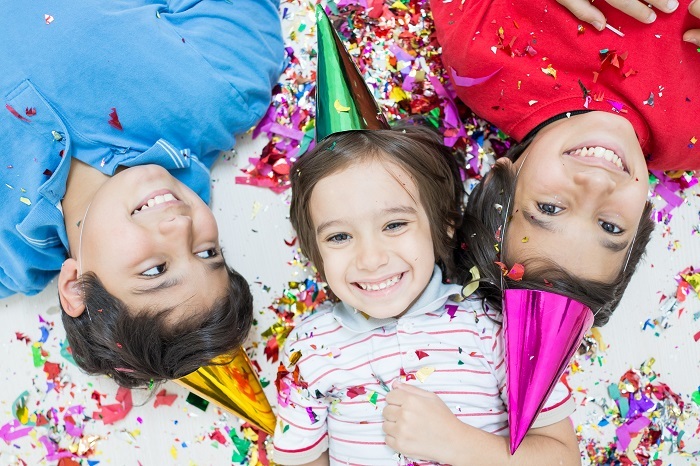 We’ve got plenty of fun ideas to make your family’s New Year’s eve a blast! Just because kids can’t have alcohol doesn’t mean they can’t have a fun, festive, fizzy drink to celebrate the coming of a new year! Try out a mock champagne and top it off with frozen grapes and raspberries to give it that special touch. All you need is 4 cups of carbonated water, 4 cups of ginger ale and 3 cups of white grape juice. It’s sweet, fizzy and looks great in fancy glasses! Cheers to the New Year! Get some empty aluminum drink cans. Make sure they’re rinsed and dry. Then, add a small amount of dry, uncooked rice or beans to each can. Cover the top with tape. Next, wrap the can with plain newsprint or white paper. If using glue, allow to dry. Next invite your children to decorate their maraca with markers, stickers and crayons. Now your child is ready to ring in the new year and make lots of noise! You can bring the excitement of New Year’s to life through artwork! Make a display of the fireworks you’ll see later in the evening using a toilet paper tube. Take one end of the tube and cut thin strips that go about half-way down the tube. Then, fold them back so that they fan out away from the tube. Next, invite your child to dip the fanned-out end into tempera paint and then push it down on a piece of white or black paper. Use several colors until the desired fireworks are created. Hang up your child’s New Year’s artwork on the fridge! Enjoy waiting for midnight (or as late as your little one’s can manage) with some festive games. These “minute to win it” games are specially adapted for New Year’s Eve and are loaded with fun for children and adults. Pick a few or try them all! Las Vegas is home to one of the greatest New Year’s fireworks displays in the world. Lasting over 8 minutes, the display is a combined effort put together by the major casinos on the strip. You can watch the show from the strip, which is closed to traffic so that pedestrians can walk freely. It will be crowded, but fun. Another great place to watch is from the LINQ Promenade’s High Roller observation wheel. You can also head over to Lake Las Vegas where there will also be a free fireworks show. Time is sure to fly by while engaging in these many fun New Year’s eve activities with your little ones. Whether you decide to stay in or head out to see the fireworks, your kids are sure to enjoy a memorable New Year’s eve. From all of us here at Certified Nannies of America, Happy New Year!